A good deli is tough to find, but once you do, life seems to get a whole lot tastier. From sandwiches to all out catering, the delis of New Jersey are among the best in the world. Whether you like them Jewish, Italian, or American, Jersey’s delis are delish. Find a new favorite nearby, or take a grand tour of the best around, with our picks for top delis in the Garden State! Harold’s sets the standard for New Jersey delis, and does so in a big way. Massive, meant-to-be-shared portions, some of the best quality meats available, and even a pickle bar to top things off. You may just be lucky enough to meet Harold himself, a lifelong deli guy who pours his know-how and community spirit into everything that comes out of this Edison institution. Hobby’s roots are firmly planted in Eastern European eats, but their vast selection covers almost every flavor of the world. Vegetarians rejoice, as this Newark location serves up a huge variety of veggie-friendly dishes, from grilled cheese to omelets, and even a vegetarian-ized Reuben! No matter your tastes, don’t you dare leave Hobby’s without sampling their famous potato pancakes! For more than 70 years, Millburn Deli has delighted Northern New Jersey with some of the best sandwiches in the country. Thoughtful combinations, top quality ingredients, and friendly service make this Millburn favorite an easy add to our list. Whether you’re after a hearty breakfast before a big day at the beach, or a bag lunch to refuel midway through, Frank’s is a Jersey Shore institution, with good reason. Choose from deli classics, Greek specialties, and even Italian selections at this Asbury Park location. If you’re looking for something quick and delicious to eat in Hoboken, you can’t do much better than Vito’s and Son Deli. More than thirty years in the business has led to a perfected process, while freshness and customer service reign supreme. Their smoked daily, fresh mozzarella has won fairly big accolades from sources including the Food Network, so be sure to try a taste or two. 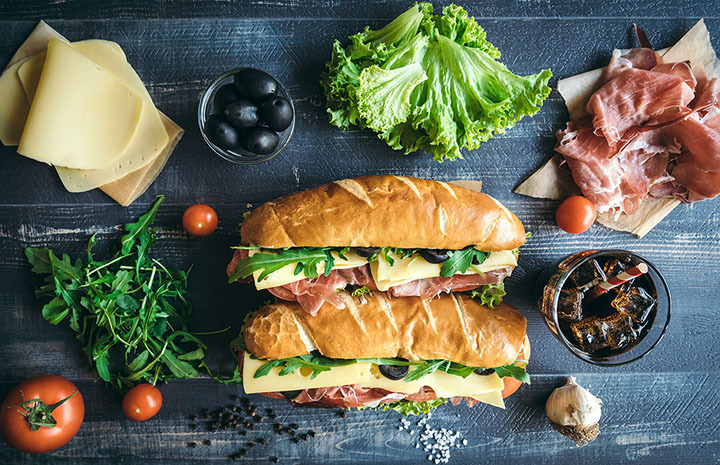 With a solid menu, and incredible daily specials, Giovanni’s Italian Deli is always a delicious choice. This Secaucus store is renowned for their in-house, fresh mozzarella, large portions, and fair prices. All the favorite flavors of New Jersey, in one convenient location. Jersey Pride Deli and Catering is a Pompton Lakes legend, offering up incredible sandwiches, salads, soups, and sides. A broad selection makes Jersey Pride a great choice for larger groups, or pickier eaters. For 60 years, Chick’s Deli has provided South Jersey with some truly tasty food, and a heaping side of good cheer. Of course, it doesn’t hurt that they serve up one of the best cheesesteak sandwiches outside of Philly, too. A cash only find, Cosmo’s Italian Salumeria is often lauded as the best sandwich in Hackensack, and you won’t hear any differently from us. A true Jersey classic, with some of the best prices around and plenty of local flavor. Family owned and operated, Jersey Subs does serve up some seriously good sandwiches, but it’s the fresh soups and gorgeous salads that put it over the edge in our book. Visit for incredibly friendly service, and one of the best lunch specials in town.